GET COMBAT READY. STAY COMBAT READY. PERIOD. There are many variables in training, competition and life you can’t control. You may not be able to pick your opponent in any of those scenarios. But if you find yourself in the position where combat skills need to be used, there is one variable you could have complete control of that you can and SHOULD be working on year round. Only you can control how hard you decide to work. Fatigue is inevitable but if you’ve trained to delay it and execute technique in the face of fatigue, then you are undoubtedly more prepared than your adversary. Let me start with what this is not. THIS IS NOT A STRENGTH TRAINING PROGRAM. THIS IS NOT DOING ENDLESS ROUNDS. THIS IS NOT DOING HAPHAZARDLY PROGRAMMED “WOD’s”. It is smart, progressive programming to build new athletic capabilities while you KEEP those hard-fought gains you have made in your prior training. If you use “5/3/1”, “Westside”, “the Cube”, “Starting Strength”, or other programs…DRILLSKILL is the best program to add to your arsenal! If you don’t know what those are you will learn about them in the manual. They will become your allies in developing combat-ready strength and conditioning. Each exercise has visual and written details on the execution along with tips for exercise performance. Over 120 exercises and 100 unique workouts to get you started. You will have all the tools you need to assemble your own workouts going forward. Enter your email below to get my brutally effective combat sports training programs. Download the FREE eBOOK: The DRILLSKILL READINESS PROGRAM Designed for grapplers but versatile enough for all combat sports. Includes 75+ pages and 25 Workouts. This is the foundation block that we use to create General Physical Preparedness (GPP) for a full 12-month training cycle that contains grappling-specific movements and drills and I use with all athletes before they engage in the FULL DRILLSKILL program. 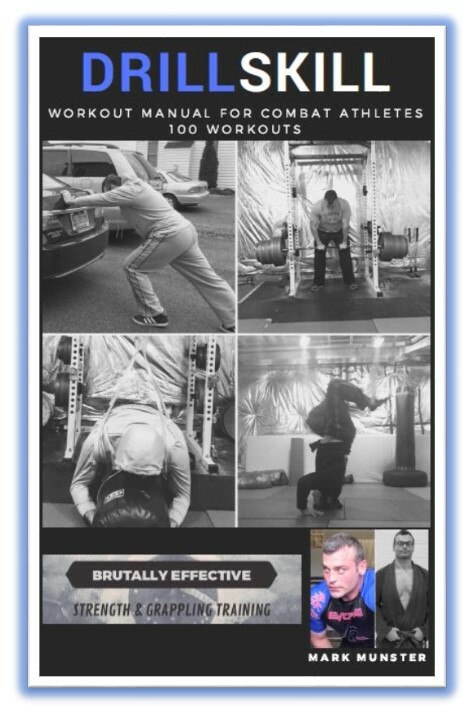 Download the FREE 12-Month Strength Training 101 Template: This is a program to lead you into the DRILLSKILL program. This is an introduction to FULL-BODY strength training sessions. It is essential you train your entire body as a unit if you plan to be an explosive grappler. This is often a missing ingredient in the grappling recipe. In the field of competition, technique being equal, the stronger athlete will often prevail. FREE INSTANT ACCESS to articles, videos, and tips about making the most of your on the mat and off the mat training. 100% SUPPORT. I stand behind all of my products and services ready to help you get the most out of your investment. I offer you my products FREE before you ever have to purchase anything. MONEY BACK GUARANTEE. Even after you purchase from me, you have 30 days from the date of purchase to evaluate your product and receive a 100% refund of your purchase price and you can keep the product. I’m here to help you reach and surpass your goals. I don’t want anything in the way of making that happen. I won’t spam your inbox with useless emails. No $, no commitment, no gimmicks and no b.s. Just your hard work and my desire to help you reach your full human potential. Disclaimer: I am not a medical professional. This site offers fitness information and is designed for informational purposes only. You should not rely on this information as a substitute for, nor does it replace, professional medical advice, diagnosis, or treatment. If you have any concerns or questions about your health, you should always consult with a physician or other health-care professional. Do not disregard, avoid or delay obtaining medical or health related advice from your health-care professional because of something you may have read on this site. The use of any information provided on this site is solely at your own risk.